We are pleased to provide you with quote based on a size of your group and your plan. Click on the banner of each experience, you can see the details of the each experience. Jidaiya has reasons to be chosen. ①You just show up and enjoy the program. 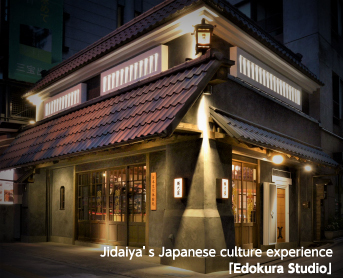 ②Large variety of “profound” and “authentic” Japan experiences are available here. ③A good way to utilize your spear time in Asakusa. ④Large groups and school trips are welcome. ⑤Photo sessions are available to create you a lasting memory of Asakusa visit. ⑥Combination of Rickshaw ride and Japanese Culture Experience is a popular choice. ⑦Baggage check-in service is free of charge for our Culture Experience customers. ①Capacities and times on this web site are rough estimates. For further detail, please contact us. ④Our staff is able to provide basic English explanations. ⑤Please note we might ask a small group to join another group when required. ⑥You can take photos, but Video shooting and recording can not be. ⑦If you cancel your reservation, you will be charged the cancelling fee. Try tea ceremony at Jidaiya. Staff explains the history and principles of Japanese tea ceremony, how to use tea utensils and how the tea ceremony goes. Then you experience the actual process of making tea. Not only guests from overseas, but also Japanese guests will be surely able to enjoy this popular tea ceremony experience. *depends on the size of your group. *Optional course of “Kimono & tea ceremony” is also available. ■Available for the tatami floored traditional Japanese room to experience more genuine tea ceremony. *For a group of more than 6 persons, 1,000 yen/person (not including tax) will be charged as additional cost. Please let us know the size of your group. Experience participation possible age is over 6 years old. But in case of "Reservation" (option), we will be able to accompany. Please offer at the time of reservation. We may ask you to join with other groups. If you prefer to experience only by yourselves, please let us know when you book. We propose a suitable plan for you in order to meet your request, such as those who cannot sit in a Japanese style and those who are VIP customers. Please feel free to let us know. This program will give you a nice souvenir from your Asakusa visit. You are to write your favorite Japanese character (Kanji, Hiragana and Katakana) with ink and brush on washi paper. We are ready to assist you to choose which character you want to write! This program is for Japanese culture experience, not a lesson by a professional instructor. *Please let us know the size of your group. Are you in Japan? Then, why don’t you wear Kimono! We are proudly showing you a large variety of traditional costumes from gorgeous Furisode to cool Samurai costumes, from which you choose one and enjoy being in it, as well as being in pictures. If you have kids, bring them with you! We have kids size as well. By the time the program is finished, photos would be printed and ready for you to take home. *If you come alone, please choose at least 2 costumes. （You can enjoy strolling or rickshaw ride in Asakusa area in Kimono. *Sorry, but not all Kimonos are available for this optional. Please tell us if your group is large. Assemble your own paper lantern, with a cool kanji character or your favorite image on it. It creates a nice souvenir from your Asakusa visit! As an option, you can have an electric candle set in your lantern. Create your own personalized lantern by placing your name, favorite characters or design on a genuine paper lantern. The lantern is a traditional Japanese craft and they are perfect to give as a gift or keep as a souvenir. The lanterns fold up to become smaller so are quite easy to take home with you. The Andon lamp is a simple and yet modern design with Japanese washi paper covered both sides in acrylic, rolled into a tube and attached to a base and a top cover. It is easy to roll the paper flat to draw a design. Let’s try our traditional craftwork! Tsumami-Zaiku is a traditional Japanese craftwork. Cut thin silks or crepes called Chirimen in a square and fold them to form into various shapes. It is said that the craftwork has started from Edo period. 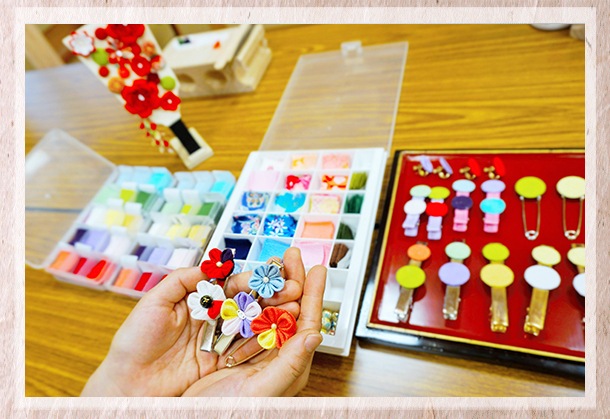 Even now, gorgeous Tsumami-Zaiku are used such as Kanzashi. Let’s create your original accessory using colorful and beautiful Chirimen! *Reservations are accepted from two people. This program uses a tweezer and accepts from over 6 years old. Please tell us in advance if your child is under 6 years old. We propose a suitable plan in order to meet your request, such as the number of people and VIP customers. Please feel free to let us know. Play a traditional and elegant Fan-throwing Game, which has been played since Edo period. This game is suitable for only one person as well as a group. Throw a fan and win Jidaiya’s original prize! Fan-throwing in Kimono option is available. Among various fan-throwing rules, our game rule is simple and easy to learn. You can experience Shamisen, traditional Japanese musical instrument. After learning Shamisen’s history and basic techniques, your instructor assists you to play traditional music with real Shamisen. You’ll be able to play even it’s your first time! We offer you “Shamisen Plus” plan, which provides you with Shamisen in Kimono. Beat the soul out! Playing the Japanese drum is even better than listening to it, so let’s learn how to play it! *For a group of more than 4 persons, 5,000 yen/person (not including tax) will be charged as additional cost. Optional program to wear traditional hanten, haragake or matahiki costumes and play the drum is available. ・Join this program in casual clothes suitable for light exercise. ・Drum program is held in a place other than Jidaiya because of its loud sound. ・This program is for Japanese culture experience, not a lesson by a professional instructor. The word Iai consists of “I” (=regular daily life) and “ai” (=encounter with adversary). Iai is to learn how Samurai intimidates and subdues his adversary with strong determination and sword technique. You will learn Bushido or Samurai spirit as well as sword technique through the experience. When samurai draws his sword, he puts his life at stake. You will see his zeal exploding from his physical/mental spirit, and his soul bounces when the samurai draws his sword and changes the static air into dynamic one. Iaido is about profound bushido spirit of “static” and “dynamic”, “shadow” and “shine”. After the explanation of Iaido’s history and its spirit and basic demonstration, it is your turn to try it alongside your instructor with a sword. *Iaido is a profound and pragmatic sword technique for a situation like “Fighting should not take place, but if necessary, technique needs to be ready to subdue adversary”, therefore please understand this is NOT a stunt show like Ninja/Samurai show. “Samurai Sword Experience Plus” program is available; you can experience Iaido in special uniform. ・This program is for over 6 years old. Be a Japanese Samurai with strong armor!! The plan offers you to be a cool Samurai wearing a real armor of the Sengoku period in the traditional Japanese room. You can also take a gorgeous photo in Samurai poses. Reservation accepted from two people. Props are available; battle surcoat, commander’s fan, signal baton, battle field fan and weapons like spear and harquebus. Armor size is for adults; you need to be at least 155 cm. Available for free photo shooting time; make sure to bring your camera/cellphone. In case of large groups, we conduct the experience in order, not at the same time. Yes, it has a long history and tradition --- but don’t gird yourself; because it is an entertainment! Just relax and enjoy the performance. Performances of Edo-kagura, Edo paper crafts, Tsugaru-shamisen, koto(Japanese harp), rakugo comedy, picture story show, etc. For large groups, it is recommended to split into smaller groups for rickshaw tours and traditional entertainment program. Some of the entertainments welcome you to the stage - don’t hesitate to participate. *Optional: Real Meiji era & Taisho era rickshaws are available. Hire a rickshaw driven by a professional driver. Do not miss this rare chance to experience “Kago” basket palanquin! You can enjoy carrier experience, customer role and learning its historicalbackground. 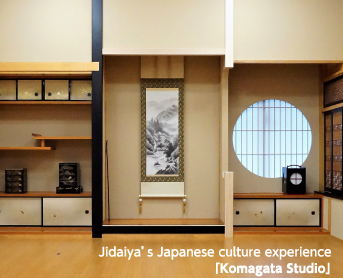 Jidaiya owns a replica of Kago, which was a major means of transportation back in Edo era. You will find Kago is heavy, but that is a “weight of history”: you will feel, with your own body, the profound and “heavy”meaning of transportation shifted from two-men Kago to one man rickshaw.Because of that shift, the Kago carriers lost their job when Meiji era arrived, as you can imagine. The combination of Kago experience and Rickshaw experience will clearly show you the “Transportation shift” from Edo Period to Meiji.